“You can manage your career your way. You can put yourself in the driver’s seat steering yourself toward destinations of your choice. So make the commitment to treat yourself like a product to continually upgrade yourself and differentiate yourself from others.” So begins author Lisa Quast in a book on thoughtful professional planning Your Career Your Way! Having developed strategic plans in her marketing career Quast asked herself “What could I achieve if I applied a business concept to myself?” She tried the strategic planning process out on her own career before offering the method to other women in this book. Written in a crisp no-nonsense style the premise of Your Career Your Way! is that women should view their talents and skills as competitive products to be offered carefully to potential employers. The exercises include a number of self-surveys to help readers develop a proactive set of skills through self-examination and goal-setting. Each chapter is packed with thought-provoking exercises that help readers to manage their careers rather than to stumble from one serendipitous employment to another. Strategic planning was developed to help businesses position themselves competitively. Using Your Career Your Way! the reader can do the same for themselves following ten crucial steps from assessing assets and liabilities to goal setting and finally to success. This is a working book meant to be written in digested and taken seriously as a basis for developing a professional lifestyle. 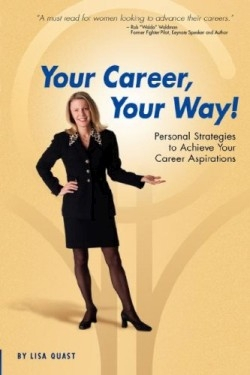 The author uses two fictional women with different skill sets and different goals to illustrate how to construct a strategic career plan. One is a married mother of two who aspires to be a clothing buyer the other a single woman whose goal is to become a vice president of marketing. Together these characters help the author demonstrate the strategic career planning process. The book is sprinkled liberally with inspirational quotes from famous women quotes that set the stage for the reader’s identification of professional strengths weaknesses opportunities and threats. Examples are given for each exercise followed by templates for the reader to complete and supplemental information on finding a mentor selecting a coach goal-setting evaluating accomplishments and celebrating success. The book seems geared for individuals pursuing a career in the business world and is in that way restrictive. In truth the material it contains could be applied in many professional fields as self-study seminar material or supplemental text. Your Career Your Way! would be an excellent gift for any woman developing a professional career.